We are ranked amongst the most trusted firms deeply engaged in offering a wide range of Women Mojaries. These products are speciality of Rajasthan. 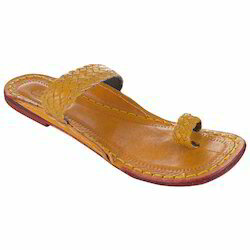 In order to meet excellent quality standards, we are supplying Women Jutti. Made from high quality material, this pair of ballerinas ensures durability and maximum comfort while walking on unyielding surfaces. 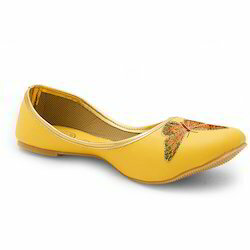 These have colorful Butterfly resham zari design on top and zari work on the Yellow inner sole too. The pair will look awesome when you team them with your stylish outfits. Made from high quality material, these are durable too. Luxurious and comfortable, this pair of ballerinas from Little India will add an instant touch of glamour to your appearance. 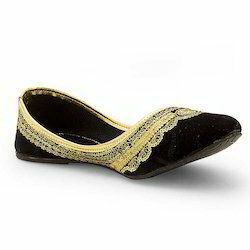 These Ballerinas have peacock feather shape golden sequin design in front along with zari work. The pair promises durability that is one of the signatures of the brand. Team it up with your daily wear and look your stylish best. Luxurious and comfortable, this pair of ballerinas from Little India will add an instant touch of glamour to your appearance. These have Golden Sequins and zari work on the black velvet base with golden lining. The pair will look awesome when you team them with your stylish outfits. Made from high quality material, these are comfortable and durable too. 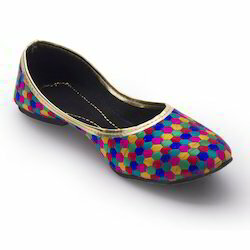 Get into the feminine groove of styling with these multicolor ballerinas by Little India. These have Golden sequins and zari work in sitara shape along with red and green resham embroidery work on the black velvet base and insole. The golden color lining makes this pair even unique to wear. Made from high quality material, these are comfortable and durable too. Get noticed in every party with this pair of ballerinas from Little India. 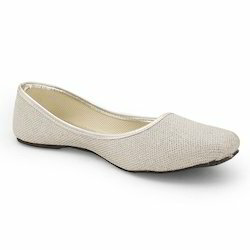 These have shimmering silver color upper with silver color inner sole and lining. The pointed tip of these ballerinas makes them a style statement to wear. The pair will look awesome when you team them with your stylish outfits. Made from high quality material, these are comfortable and durable too. Adorn your self in the glamourous style with these Multicolor resham embroidery ballerinas to mesmerize any party. The zari work in bindi pattern makes it look awesome. Team it up with your pair of denims and tee for a stylish look. These new age sophisticated ballerinas are the perfect inspiration for a fashionable look. Be the fashion glitterati by wearing this pair of beautiful ballerinas which hold the manufacturing perfection of Little India. These have multicolor striped embroidery on the top along with the bindi design zari work allover. The maroon insole makes these even unique to wear. The pair looks best when teamed with your daily outfits. Made from high quality material, these are comfortable and durable. Let yourself feel like a diva by wearing the pair of these maroon shimmering ballerinas. These have golden glossy inner sole along with the golden color lining. The pointed tip of these ballerinas makes them a style statement to wear. The pair will look awesome when you team them with your stylish outfits. Made from high quality material, these are comfortable and durable too. Get into the feminine groove of styling with these ballerinas by Little India. These have multicolor embroidery work allover in beehive hexagonal shape along with the golden color lining. 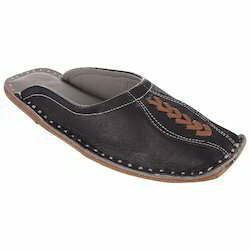 This pair is perfectly designed to ensure that your feet can relax comfortably. These sophisticated ballerinas without a doubt are one the perfect inspirations for a fashionable look. 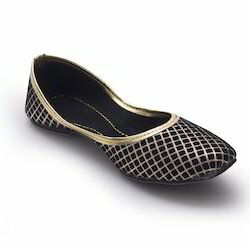 Experience the endless comfort with this black ballerinas even when you wear it all day long. These have golden chequered design allover on the black velvet base. The shimmering look and golden color lining makes this pair look awesome. Team it up with your casual dresses to look fabulous every day. With its glamorous fusion of simplicity and elegance, it matches well even with your traditional attires and can make you look stylish any time of the day. Be the fashion glitterati by wearing this pair of beautiful sandals which hold the manufacturing perfection of Little India. These have multicolor striped pattern resham embroidery with golden color bordering. The pointed tip of these sandals makes them a style statement to wear. The pair will look awesome when you team them with your stylish outfits. Made from high quality material, these are comfortable and durable too. Show your true style with this glamourous pair of sandals. These have silver zari work on the black base and the silver color lining of synthetic leather. The pointed tip of these sandals makes them a style statement to wear. The pair will look awesome when you team them with your stylish outfits. Made from high quality material, these are comfortable and durable too. Get noticed in every party with this pair of ballerinas from Little India. 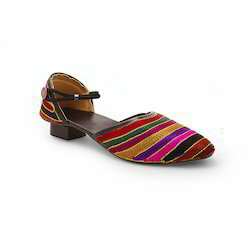 These have colorful zari gola design on velvet base along with the platform heel. The pointed tip of these ballerinas makes them a style statement to wear. The pair will look awesome when you team them with your stylish outfits. Made from high quality material, these are comfortable and durable too. Experience the endless style with this pair of multicolor sandals even when you wear it all day long. 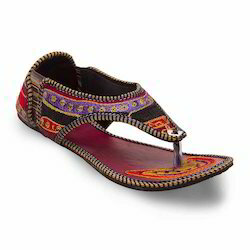 These have Resham zari Embroidery allover and also on the maroon inner sole. The zari bindi work gives them an extra grace. These possess elastic in the back for good grip over you feet. The pair will look awesome when you team them with your stylish outfits. Made from high quality material, these are comfortable and durable too. Get noticed on every special occasion with this pair of slippers(chappal) from Little India. 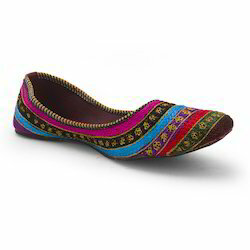 These have Multicolor resham embroidery and Zari Bindi Work along with the velcro closing. 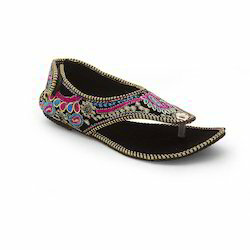 The zari resham embroidery is also done on the insole as well with delicacy. The pair will look awesome when you team them with your stylish outfits. Made from high quality material, these are comfortable and durable too. A perfect combination of style and elegance, this trendy pair of sandals from Little india is a must have in your footwear collection. These have Zari bindi and turquoise-pink resham embroidery work allover on black velvet base. The paisley(kairy) design infront gives it a rich look with velcro closing. The pair will look awesome when you team them with your stylish outfits. Made from high quality material, these are comfortable and durable too. 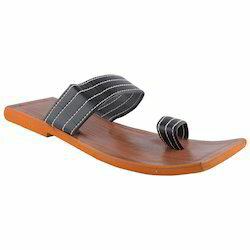 Get noticed on every special occassion with this pair of slippers(chappal) from Little India. 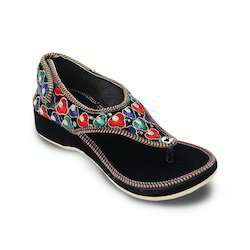 These have colorful Beads fixed allover along with the multicolor and multi design innersole too. The square shape tip infront gives it a rich look. The pair will look awesome when you team them with your stylish outfits. Made from high quality material, these are comfortable and durable too. Made from high quality material, this pair of slippers ensures durability and maximum comfort while walking on unyielding surfaces. 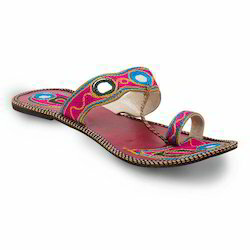 These have V shape straps, green-golden zari-resham embroidery on the inner sole as well as on the straps. The zari embroidery has been done in the bindi shape design. The pair will look awesome when you team them with your stylish outfits. Made from high quality material, these are comfortable and durable too. 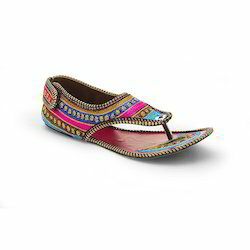 Let yourself feel like a diva by wearing this pair of multicolor slippers(chappal). These are Angutha Patti chappals which have big sequins work and embroidery on the maroon color inner sole as well as on the anughta patti. The pair will look awesome when you team them with your stylish outfits. Made from high quality material, these are comfortable and durable too. Be the fashion glitterati by wearing this pair of simple and sober slippers(chappal) which hold the manufacturing perfection of Little India. 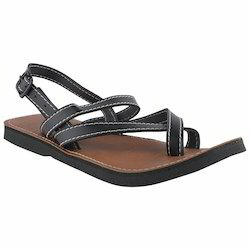 These have purple color insole and red straps in V-shape design. The pair will look awesome when you team them with your stylish outfits. Made from high quality material, these are durable too. Simple and minimal design combining with comfort and falling in line with your demand for the latest in fashion. Presenting these brown juti style mojari shoes for men made of Leather. 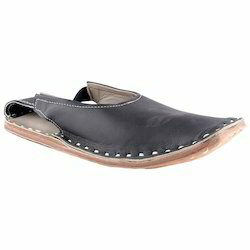 The Tip is square in shape and the inner sole is also made of leather. These are soft and extremely comfortable to use. Fashion is incomplete without these kind of Traditional Leather Footwear (Mojari) in Rajasthan, known for its high Quality Craftsmanship. Kings, Queens used to wear specially designed Mojaris. 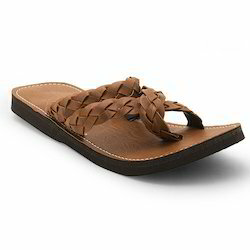 They are hand stitched with leather thongs and contain no nails. Jodhpur, Barmer, Bikaner and Jaipur are world famous for their intricacy and finely designed jutis. Let your footwear collection be Ethnic and stylish with these camel Brown designer kolhapuri slippers(chappal). The angutha patti design gives extra comfort to your foot thumb with extra style along with pointed tip shape too. The rubber sole gives you good grip on the slippery surface. These are for men who want to look perfect for every casual occasion with comfort. 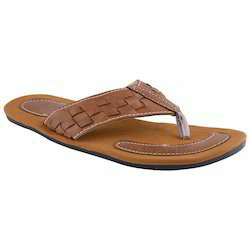 Let your footwear collection be Ethnic and stylish with these Tan color designer slippers(chappal). The straps on the top are made in Silsila style for extra style. The rubber sole gives you good grip on the slippery surface. These are for men who want to look perfect for every occasion with comfort. Simple and minimal design combining with comfort and falling in line with your demand for the latest in fashion. 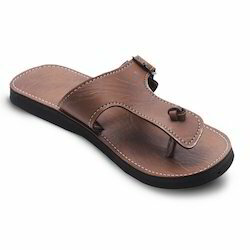 Presenting these camel brown mojari slippers(chappal) for men made of synthetic leather. 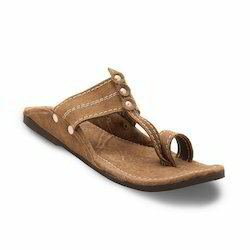 Straps on the top are v-shape in design, the Tip comes square in shape and the inner sole is made of rubber. These are soft and extremely comfortable to use as these are lightweight too. Casual fashion is incomplete without these kind of Traditional Leather Footwear (Mojari) in Rajasthan, known for its high Quality Craftsmanship. They are hand stitched with leather thongs and contain no nails. 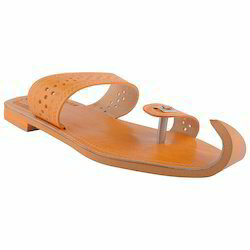 Jodhpur, Barmer, Bikaner and Jaipur are world famous for their intricacy and finely designed mojari chappal. 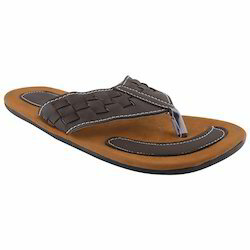 These are Brown V-shape design strap slippers(chappal) made of synthetic leather with the rubber sole. These have square tip shape to give the extra comfort by giving enough space to your frontal part of the feet. These are soft and extremely comfortable to use as these are light weight too. Jaisalmer, Jodhpur, Barmer, Bikaner, Pali and Jalore are world famous for their intricacy and finely designed leather slippers. 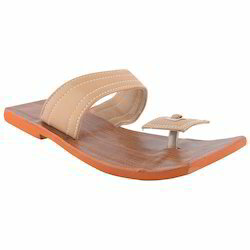 These are Tan color buckle design straps slippers(chappal) made of synthetic leather with the rubber sole. These have square tip shape to give extra comfort by giving enough space to your frontal part of the feet. These are soft and extremely comfortable to use as these are light weight too. Jaisalmer, Jodhpur, Barmer, Bikaner, Pali and Jalore are world famous for their intricacy and finely designed leather slippers. Black Square Toe design Half Boot Jutti made of Synthetic Leather with Leather Sole for Men of all age. Black Square Toe design Full Boot Jutti made of Synthetic Leather with Leather Sole for Men of all age. 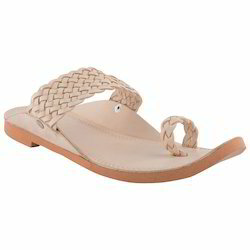 Beige Square Toe design Flip-Flop Slipper made of Synthetic Leather with Rubber Sole for Men of all age. 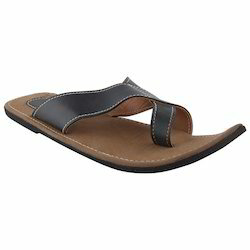 Black Square Toe design Flip-Flop Slipper made of Synthetic Leather with Rubber Sole for Men of all age. 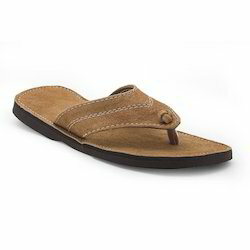 Tan Round Toe design Flip-Flop Slipper made of Synthetic Leather with Polyurethane Sole for Men of all age. 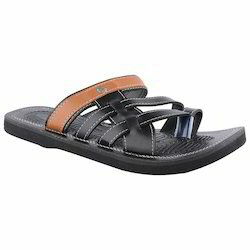 Black Round Toe design Flip-Flop Slipper made of Synthetic Leather with Rubber Sole for Men of all age.